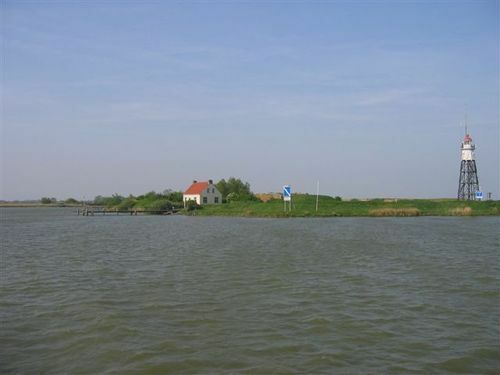 Vuurtoreneiland ("Lighthouse Island") is a small island in the IJmeer, Netherlands, just off the coast of Durgerdam. The island's main function is as a base for a lighthouse; a military fort on the island was abandoned in the 1930s. The island is a UNESCO World Heritage Site. It is owned by the Dutch state, and is managed by Staatsbosbeheer. Since a few years, a restaurant is located on the island, with a daily ferry service from Amsterdam. Vuurtoren "De lantaarn van Ijdoorn"
Battery along the Sloterweg (Defence line of Amsterdam) accommodated approximately 56 men and 6 non-commissioned officers. 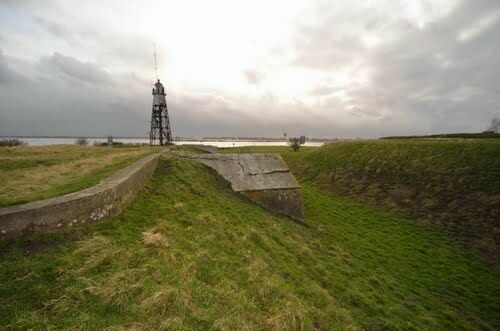 Main purpose of the fort was to offer flank protection to the Geniedijk. The Coastal Battery near Diemerdam is currently closed for renovation. Battery near Diemerdam, Zuiderzee front, Defence Line of Amsterdam. Developments in warfare during the Franco-Prussian War of 1870 prompted another round of upgrades and the construction of forts part of the Stelling van Amsterdam, Casemates Muiden-West. The Fort along Den Ham is a fort that is part of the UNESCO World Heritage site of the Stelling van Amsterdam. It's located along the railroad from Uitgeest to Krommenie. The earthen walls date from 1896, the fort itself was finished in 1903. In 1885 the fort was completed as a defendable earthwork. It was not until 1914 that the fortress reached its final completion, though, when the construction of the shellproof building was finished. The function of the Fort along Middenweg was to defend the access that was formed by the Middenweg and Zuiderweg roads. In 1885 the fort was completed as a defendable earthwork. It was not until 1914 that the fortress reached its final completion, though, when the construction of the shellproof building was finished. In 1886 the Fort along Nekkerweg was completed as a defendable earthwork. The shellproof building was finished in 1912 for the purpose of defending the accesses that were formed by the Nekkerweg and Volgerweg roads in the Beemster Polder. The UNESCO World Heritage Site known as the Defence Line of Amsterdam (in Dutch named Stelling van Amsterdam) is a 135 km long ring of fortifications around Amsterdam, consisting of 42 forts located between 10 to 15 kilometers from the centre, and lowlands that can easily be flooded in time of war. 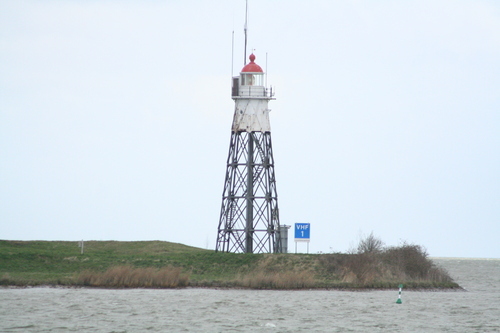 The Fort along the Liede is one of the four fortresses that were built after the reclamation of lake Haarlemmermeer. On the northern part of the fort’s grounds there is a casemate carrying the Mercury emblem of the Corps of Engineers and the year 1914. The Fort along the St. Aagtendijk has been given a remarkable new lease on life as a rehearsal space for musicians. Unique to this fort is the front caponier that was made from concrete: it’s an extension to the centre of the fort’s front wall that is outfitted on both sides with embrasures that could be used to fire sideways. The front of this caponier was protected against shellfire by a heavy protective earth wall. The landscape in between the Fort near Waver-Amstel and the Fort along the Winkel has remained virtually unchanged since the construction of these fortresses. Ossenmarkt Fort, locally known as Fort aan de Ossenmarkt (which literally translates to Fort at the Oxmarket), lies in the town of Weesp, in the province of Noord-Holland in the Netherlands. The Fort in the Botshol is the only Defence Line fort whose defensible earthwork from 1895 has been preserved. The soggy peat soil around Amsterdam made it necessary to first strengthen the terrain with large amounts of sand. Also unique is the bridge behind the fort watchman's house, whose centre piece could be removed in times of danger. The UNESCO World Heritage Site known as the Defence Line of Amsterdam (in Dutch named Stelling van Amsterdam) is a 135 km long ring of fortifications around Amsterdam. Fort in the Zuidwijkermeerpolder, Northwest front, Defence Line of Amsterdam. Fort Island IJmuiden (Dutch: Forteiland IJmuiden) is situated at the estuary of the Noordzeekanaal and is part of the Defence Line of Amsterdam. This sea fort island was built in 1885 as the most important advanced defence post of the entrance to Amsterdam. Fort near Aalsmeer (1905), in popular language also called Fort Rijsenhout, is part of the Defence Line of Amsterdam. The fort is made with a double fort canal. Special is that the lever dome buildings remained intact, while most of these were taken apart and blown up during World War II. The oldest land based fort of the Defence Line. The bombproof buildings were built between 1884 and 1887 of both old style brick and modern concrete. The masonry is in perfect condition and still looks as if it was finished last year. The Fort bij De Kwakel is a fort that is part of the Defence Line of Amsterdam. It's located in the village of De Kwakel. It's one of four forts that form the linie Kudelstaart - Uithoorn. To the west is fort bij Kudelstaart, to the east you find fort aan de Drecht and fort bij Uithoorn. At one point in time 255 officers and soldiers were stationed at the fort, armed with five cannons and nine machine guns. Fort near Edam, North front, Defence Line of Amsterdam. Today the grounds of the Fort near Hinderdam are hardly recognizable as such, because the island is fully overgrown. Natuurmonumenten (a society for the preservation of nature monuments in the Netherlands) consciously allows nature to erase the traces of the military past. The UNESCO World Heritage Site known as the Defence Line of Amsterdam (in Dutch named Stelling van Amsterdam) is a 135 km long ring of fortifications around Amsterdam. Fort near Hoofddorp, Southwest front, Defence Line of Amsterdam. 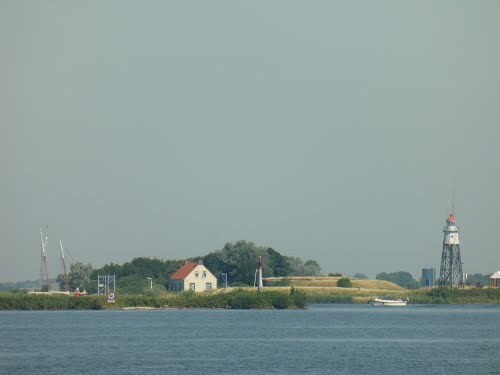 The Fort near Krommeniedijk served to defend de Lagendijk (dike) between the towns of Uitgeest and Krommenie and the navigable waterway Krommenie. In 1896 the defensible earthwork of this fort was finished, whereas the shellproof building was completed in 1903. The UNESCO World Heritage Site known as the Defence Line of Amsterdam (in Dutch named Stelling van Amsterdam) is a 135 km long ring of fortifications around Amsterdam. Fort near Kudelstaart, South front, Defence Line of Amsterdam. The function of the Fort near Kwadijk was to defend the accesses that were formed by the Amsterdam-Hoorn railroad and the Middelie-Axwijk road. Construction of the defendable earthwork with moat was completed in 1895, but work on the concrete fortress was abandoned with nothing but the foundations and part of the flooring put in place. 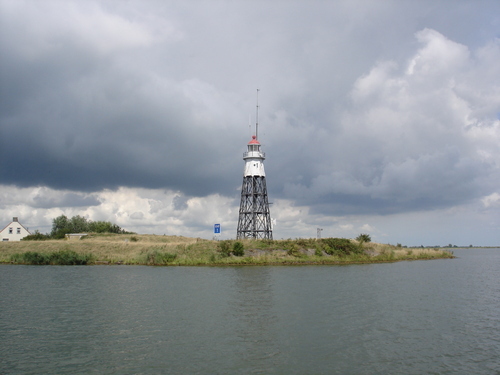 The Fort Markenbinnen is currently being used by RBOC "Fort Markenbinnen", an education and training centre for firefighters and rescue workers. This foundation has refurbished the fortress. The wooden partitions in the fort’s premises and the sanitation facilities are still in place. 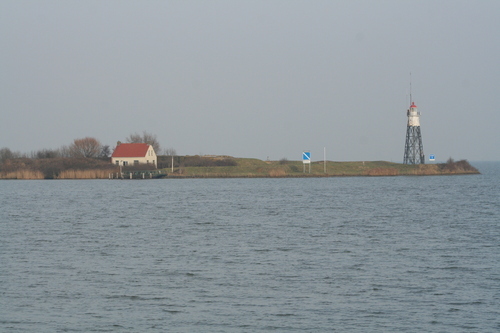 The Fort near Nigtevecht was completed in 1903. Recently, a large part of this stronghold was made waterproof and restored by Stichting Herstelling, a Dutch foundation that offers work experience to the jobless. The UNESCO World Heritage Site known as the Defence Line of Amsterdam (in Dutch named Stelling van Amsterdam) is a 135 km long ring of fortifications around Amsterdam. Fort near Penningsveer, West front, Defence Line of Amsterdam. Fort near Spijkerboor (1913) is one of 42 fortifications of the so-called Defence Line of Amsterdam. Recognized by Unesco as a World Heritage site, Mostly mostly due to the ingenious concept of using controlled flooding, to stop the enemy. The UNESCO World Heritage Site known as the Defence Line of Amsterdam (in Dutch named Stelling van Amsterdam) is a 135 km long ring of fortifications around Amsterdam. Fort near the Liebrug, West front, Defence Line of Amsterdam. The UNESCO World Heritage Site known as the Defence Line of Amsterdam (in Dutch named Stelling van Amsterdam) is a 135 km long ring of fortifications around Amsterdam. Fort near Uithoorn, South front, Defence Line of Amsterdam. The Fort near Veldhuis had the job of defending the causeway coming from Heemskerk/Assumburg. This dike served in part to regulate the accurate flooding of the land on both of its sides (inundation dike). The defensible earthwork was completed in 1893, the shellproof building in 1897. This is the only Defence Line fortress made of concrete that has been partly demolished. The fort was outfitted, amongst others, with three turrets with 150 mm guns. These had a long range and could fire at targets as far as the estuary of the North Sea Canal and the area between the towns of Haarlem and Castricum. Fort Vijfhuizen is one of forty-two forts in the Defense Line of Amsterdam (Dutch: stelling van Amsterdam), a World Heritage Site. 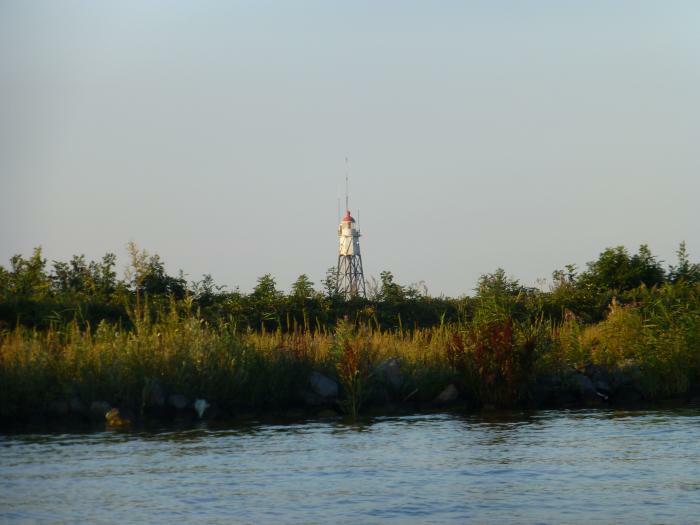 It is located in the town of Vijfhuizen on the ringvaart which surrounds the Haarlemmermeer polder. The Fort north of Purmerend was constructed in order to defend the accesses that were formed by the Beemsterringdijk (dike) and the Purmerenderweg and Rijperweg roads in the Beemster Polder. The UNESCO World Heritage Site known as the Defence Line of Amsterdam (in Dutch named Stelling van Amsterdam) is a 135 km long ring of fortifications around Amsterdam. Fort North of Spaarndam, West front, Defence Line of Amsterdam. 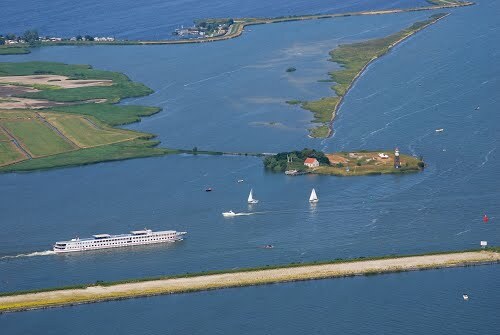 Pampus is an artificial island and late 19th-century sea fort located in the IJmeer near Amsterdam. It now belongs to the municipality of Gooise Meren and is open to visitors. The UNESCO World Heritage Site known as the Defence Line of Amsterdam (in Dutch named Stelling van Amsterdam) is a 135 km long ring of fortifications around Amsterdam. Fort South of Spaarndam, West front, Defence Line of Amsterdam. Fort Uitermeer forms part of the "New Dutch Water Line" - a defence line built in the 1840' s - and is unique due to its strategic location on the river Vecht. Muiden Fortress (Dutch: Muizenfort - 'fort of mice') is a Dutch fortress in Muiden. It is part of the defence line of Muiden, that is part of the Stelling van Amsterdam, the UNESCO World Heritage site that consists of a set of forts around the city of Amsterdam. West Battery is a smaller fort from the Defence Line of Amsterdam (Stelling van Amsterdam). It is located near the waterfront at the western end of town, there is a very small but nice sandy beach next to it.